Gakonyi Farmers Self Help Group in Mathira East Sub County has greatly increased their production after being offered extension services from the County Government of Nyeri Agricultural Extension officers.This is a self -help group of coffee farmers that was established back in the year 2006. The group was initiated as a result of sharing a common problem of realizing low productivity of about 3 Kilograms per tree from the SL 28 and 34 Coffee Variety. It is then that they were trained on how to graft the SL variety with the Ruiru Variety and now they are harvesting between 8-30 Kgs per tree. The grafted coffee also uses less fertilizer and manure. Currently, the group is made of over 40 members who meet once per month with the Agricultural Extension Officers who has been allocated to that area, Mr. Kinyua, for a Farmers Field Day. On a normal meeting day, the group discusses the various challenges they are facing and also some of the management practices to conduct. They also invite the youth in their meetings where they advise them on the importance of coffee farming. Each of these farmers has their own piece of land that they have planted coffee. 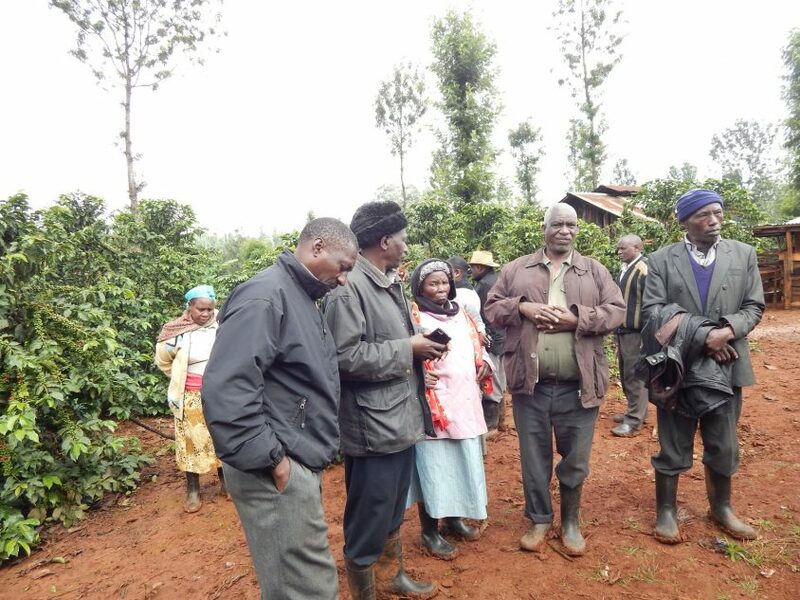 Also the group has leased three farms where they grow coffee and have a nursery for the Batian Variety. What has kept them strong is the fact that they are able to compete among self, collective finances and that they are able to identify the best farmer through a committee that they choose and award him/her finances and points. In addition, they come together and purchase fertilizer and other farm inputs at a subsidized price since they purchase them in bulk. Their greatest challenge is market fluctuation and the fact that there are only two harvesting seasons. As a result, the group has received a lot of support from the County Government of Nyeri such as group capacity building and provision of lime at a subsidized price. This helps in reducing soil PH .The Department of Agriculture also conducts research on what affects coffee production and advise farmers accordingly.